A few weeks after the Kings acquired 26-year old center Mike Richards, Jarret Stoll stopped by MayorsManor and let it be known – he’s not feeling like a guy who’s been kicked to the curb by his apparent move to the third line this season. Fast forward a few months and Stoll is talking much bigger than just making the playoffs now. 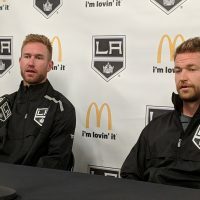 Like most of the other players in the locker room, Stoll has been feeling the increased expectations hovering above the team’s training center over the last week or so. 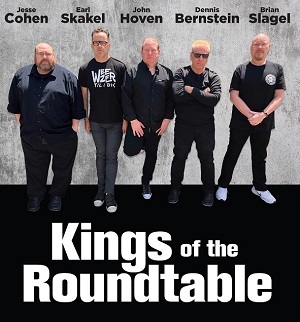 If it sounds like some of the Kings may be getting ahead of themselves – after all, they haven’t won a playoff round in over a decade – rest assured, Stoll is intent on finding the proper balance. 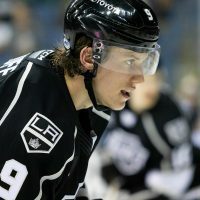 Of course, this year’s Kings team includes the aforementioned Richards, who came over from the Flyers in a late-June trade. 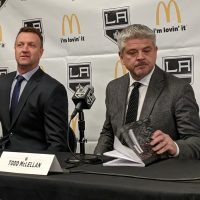 The move has allowed coach Terry Murray to move Stoll into what he believes will be a “very responsible position” for #28. 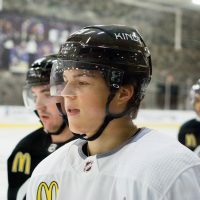 With three legitimate centers, including Anze Kopitar on the top line, Murray has the deepest Kings team on paper, since he took over as coach a few years ago. Which is part of the reason why Stoll has so openly embraced the change. 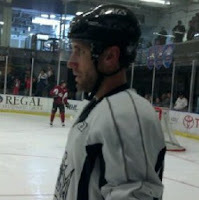 Another change for Stoll will be something he’s added to his helmet – a visor, to protect his face. Why the chance after all these years? 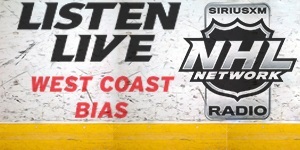 “Last year, there a couple of times where I had some scares…the game is so fast, and it can be dangerous at times, if you don’t protect yourself, and there’s been a lot of situations lately – the Manny Malhotra situation for one,” Stoll said, referring to a serious eye injury suffered by the Canucks forward. So, has it been difficult to make such a major change? If the Kings can get off to a hot start in the first month of the season, somehow, it will probably bother him even less.